[Ladyada] has been hard at work reverse engineering the charging method used by Apple products. This saga takes us through the years as new devices were released and subsequently broke Minty Boost’s charging capabilities. It seems the data lines were gradually adopted as a means for iPhones and iPods to identify the charger that had been connected. By adding voltage dividers to the D+ and D- lines you can instruct the handheld to pull 1 Amp (with data voltages of 2.8v and 2.0v) for wall chargers or 0.5 Amps (2.0v on both data lines) for portable chargers. In the video above [Ladyada] removes the surface mount resistors from a commercial charger in order to measure the voltage divider and discover the secret. [Meseta] built a powerful boost charger to top off his portable devices. He was inspired by the Minty Boost but wanted to overcome the rather limited capacity provided by the two-celled product. He ended up building his own DC to DC boost circuit rather than using an all-in-one IC. 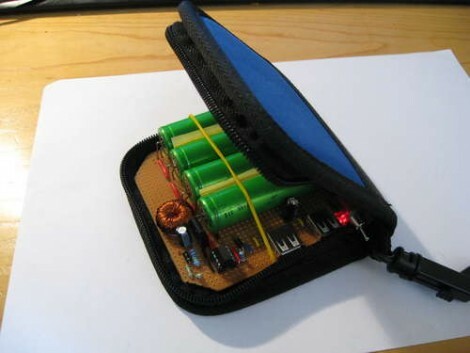 As you can see, the result uses four 18650 lithium-ion cells, normally found in laptop batteries, and can power two USB devices at the same time.